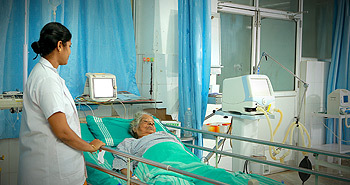 Dr. S M C S I Medical College Library was established in 2002 at the time of the inception of the college. It is a computerized information system and all the functions of the library is activated through automation. Auto Lib software system is used for the computerization of the library. Central library is an open access system and adjacent to Medical college & Hospital. It is easily accessible to the departments, class rooms, hostels and staff residences. The library is a three storied building and it occupies a total area of about 1316.98 square metre. It is one of the biggest Medical college libraries of the nation. The information storage and retrieval programmes of the central library are growing past. There are 20 departmental libraries in addition to the central library of the college. It has a collection of books, bound journals, CDS, Video cassets and floppies etc. At present Albany Medical Centre Library is thinking to developing as a National Medical Library and Information Centre of South India. The Central Library is attached to 23 departmental libraries of medical college. Those departments are Anatomy, Anesthesia, Biochemistry, Community Medicine, Dental, Dermatology, ENT, Forensic Medicine, Medical Education, Medicine, Microbiology, Obstetrics and Gynecology, Ophthalmology, Orthopedics, Pathology, Pediatrics, Pharmacology, Physiology, Psychiatry, Radiology, Respiratory Medicine and Surgery. 1. To develop information resources appropriate for Teaching, Research and development programme. 2. To support the teaching programmes of the medical college and hospital services. 3. To provide right information for the faculty, technical staffs and students of the medical college in the right time. 4. To provide information for the extension programmes of the college. 5. To establish a network of libraries among the medical institutions of the country. 6. To provide up-to-date information in the digital format through a virtual library.